It is said that during the reign of Sultan Ghias-ud-Din Balban, a young man from “Sonpal Faqirs” leaving the beautiful Chenab River Valley took abode on the bank of river Ravi which was covered with thorny bushes all around. There he came across another youth “Majid Jinjus”, of his own type, and got friendly with him. 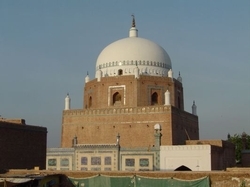 In the end of 1200 A.D when Hazrat Bahawal Haque Zikria along with three other saints returning to Multan after paying respect to “Hazrat Baba Farid-ud-Din Ganj Shakar” per chance came across those two young men, the later went away to fetch water for Hazrat Bahawal Haque Zikria. When they came back with water, they found that the saints were not there. They started tracing foot steps of about 8 kms. Towards western side of present Mian Channu Town.There they were sitting in wilderness. They also found that a spring was flowing there. Seeing that, both at once dropped on the feet of Hazrat Bahawal Haque Zikria .The saint embraced both the young men and prayed to Almighty for their guidance and thus they were infused with divine faith. At the same time, the saint also named them as “Mian Channu” and “Majid”. 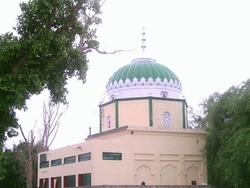 The tomb of saint Mian Channu is beautiful and is a specimen of early architectural skill. 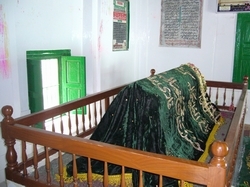 The city is named after a famous saint, Hazrat Baba Mian Channu (Rehmatallah Alahay), who is buried there and whose shrine still stands there to this day. The legend goes that after the saint's death, the town was incorrectly named and on that night the saint's spirit changed the name on the town sign to the correct spelling. Every day the authorities would change it back and every night the saint would correct it. In the end the people realized this and the town has remained named after Baba Mian Channu ever since.